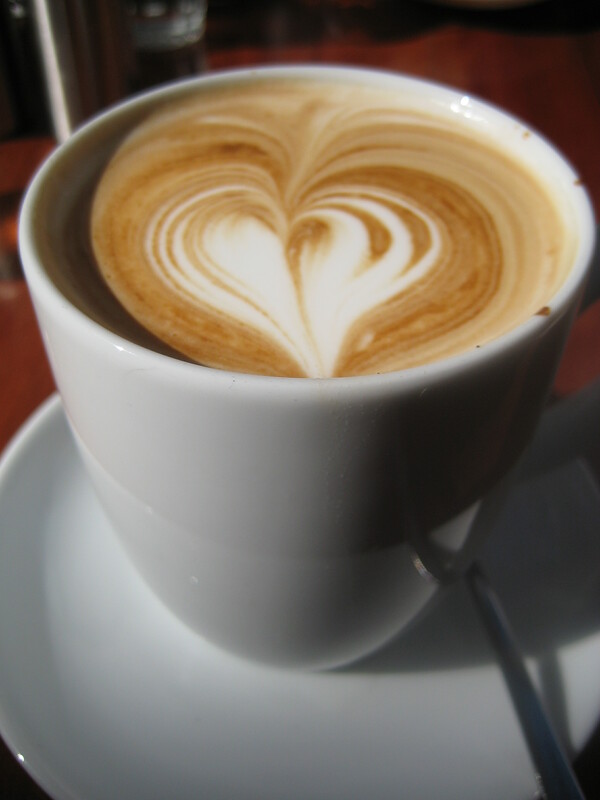 The name of the café, is actually the number of the location of the café, 485 Crown Street, Surry Hills. We came here one Sunday for brunch as I have read raving reviews. We got there about 11.30am and had to wait a good 30 mins before seated. There were 5 of us, and at most places, the bigger the group, the harder and longer the wait. The café was buzzing, lots of people eating and lots of people outside waiting, including us. I was seriously hungry by the time we were seated and in need of coffee, so ordered a large skim flat white, and it was one of the best coffees I have had! They use Single Origin coffee, so of course, I was expecting the best! It was so SO smooth, strong but not bitter – just the way I like it! My sister in law, O, and I ordered the smoked salmon and avocado on organic sour dough with ricotta, parsley and poached egg. The smoked salmon and avocado were fresh and tasty, the organic sour dough was soft on the inside and crunchy on the outside – it was definitely fresh! 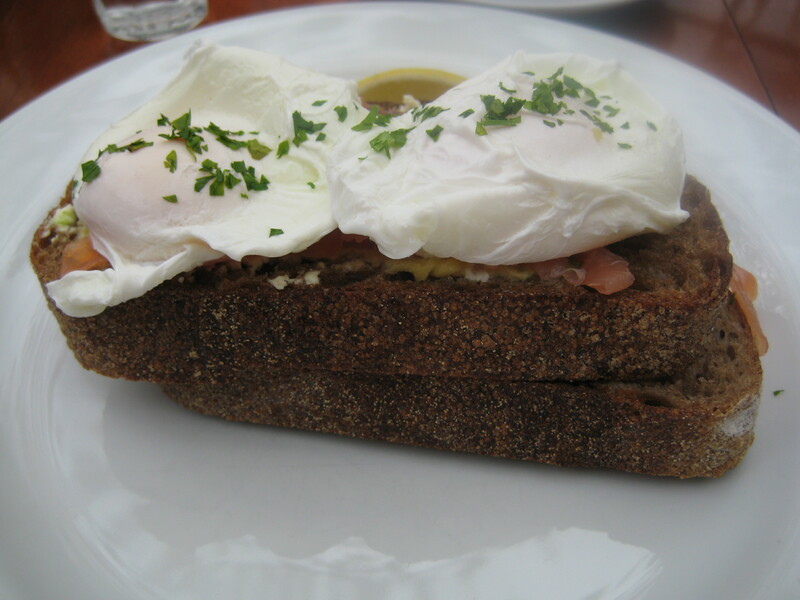 The poached eggs – perfect! It was light, healthy and delicious. 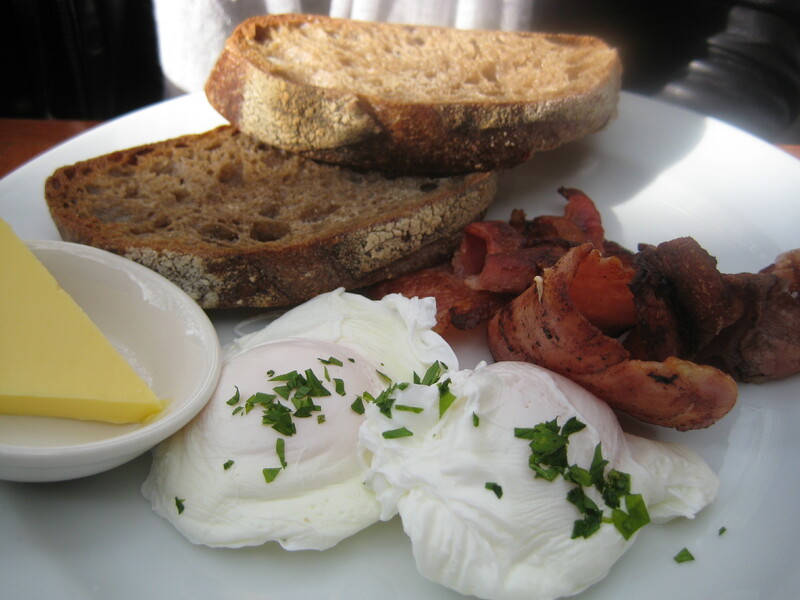 N ordered the poached eggs with bacon. I didn’t have any of this, but she did say that it was good and that the bacon was crispy and fantastic! My brother, F, ordered the beef burger with pickled beetroot, cheddar, onion relish, aioli, lettuce and homemade tomato sauce, served with hand cut chips. I am not sure why I didn’t order this – I mean aioli? I think I was trying to be ‘healthy’! 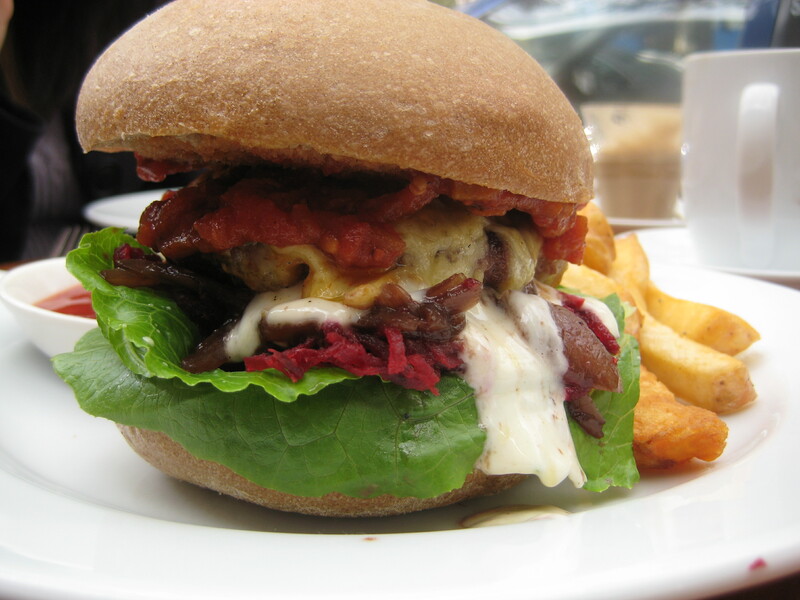 I had some of this and OMG – the combination of the pickled beetroot, cheddar, onion relish and aioli was divine! The beef patty was tender and succulent; it was a pretty good burger! 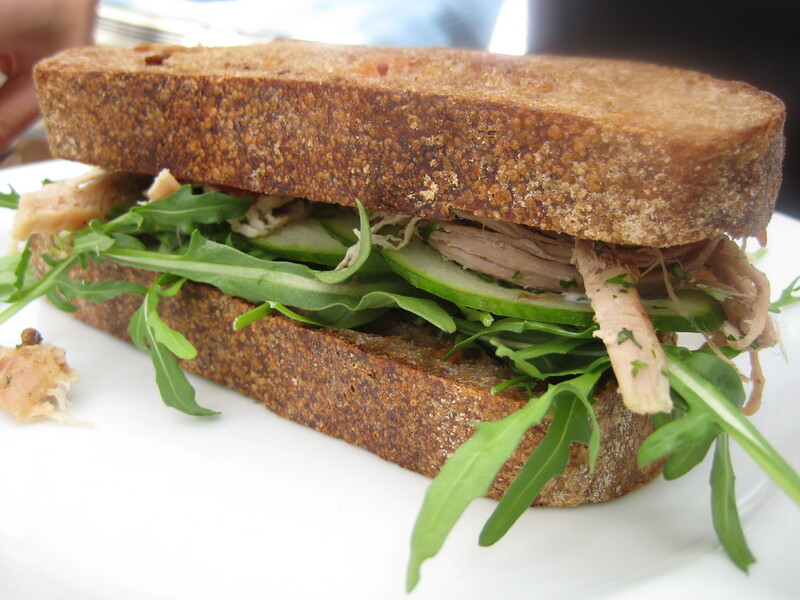 J had the pulled pork on ciabatta with pickled carrot and radish, aioli, apple and tomato chutney and rocket. Unfortunately I didn’t have any of this, as I was stuffed but it did look pretty good! J said that the pulled pork was ‘ok’ but that’s the standard answer I get from him! He said the condiments were fantastic, and was a great compliment with the pulled pork. There’s never a shortage of cafes in Surry Hills. This one is good, but I am not sure if 30 mins wait is worth it (as I don’t usually wait, but was keen to try this place!) The coffee was fantastic, and I really enjoyed the burger and the salmon and avocado toast. Would definitely love to try the Moroccan baked eggs with almonds, labne and grilled bread next time though! Unfortunately it started to rain a little, as we sat outside, so we quickly finished off our meals and went to the car. This place is about 5 mins walk from Bourke Street Bakery, so no guessing where we went after brunch!